Comparable neighboring communities include BainBridge and Saguaro Canyon or instantly search all new homes in Meridian Idaho. Paramount's tree-lined streets and thoughtful architectural design begin with the entryways into the community. They give way to the European village inspired light fixtures that dot the streets and most importantly to the homes that make up this sought after, neighbor friendly community. Located in the center of Paramount real estate is the clubhouse, host to many community events throughout the year including an annual Fourth of July celebration, tailgating events during the Boise State University football season and an annual neighborhood chili cook-off celebration held every November. The clubhouse area is also home to the fitness facility and one of the subdivisions three pools. Adding to the recreational amenities of the neighborhood, you will find miles of walking paths and a number of parks. Younger residents of Paramount Meridian, attend Paramount Elementary which is located in the neighborhood. Prior to the development of homes for sale in Paramount, Heritage Middle School and Rocky Mountain High School were built to accommodate new residents, both located within a short walking distance of the neighborhood. New homes for sale in Paramount Meridian, ID continue to be built. Future homeowners can choose from a variety of homes including small, low maintenance patio homes to more family-friendly homes that offer functional floor plans and plenty of space to stretch out. Paramount homes for sale are constructed by some of the best builders in the Treasure Valley including Brighton Homes – Eaglewood Homes – Todd Campbell Custom Homes – Alturas Homes – Hallmark Homes. 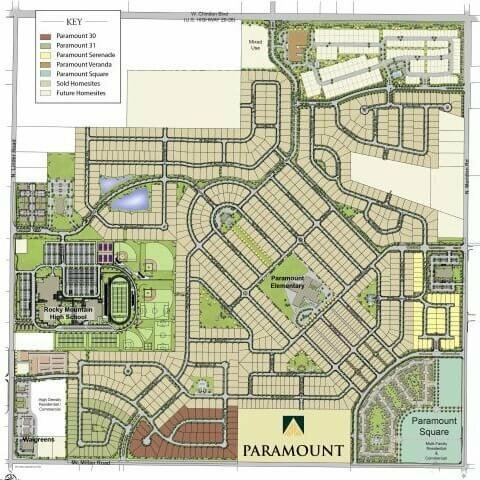 The Paramount subdivision covers one square mile, bordered by Chinden Blvd to the North, McMillan Rd to the South and Meridian Rd, Linder Rd to the East and West - Meridian, ID 83646. < All Meridian Idaho Real Estate or browse the complete guide to Meridian New Subdivisions.